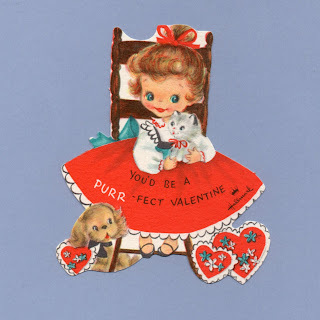 Valentine Greetings to You ~ You're sure as nice can be, And mighty nice to know, And you're Somebody's Valentine! This little birdie told me so! Hallmark officially began as an endeavor by Joyce Clyde Hall in 1910 upon his arrival in Kansas City, Missouri. The company's roots lie, however, in Norfolk, Nebraska. It was there that Joyce's brothers, Rollie and William, purchased the Norfolk Post Card Company, a bookstore, in 1891. By 1894, they had moved into the wholesaling of postcards. When Joyce arrived in Kansas City he came with a box full of postcards and his own plan to delve into the wholesaling of those cards. Was it a fit of sibling rivalry that sent Joyce almost 300 miles away to form his own start-up in competition with his brothers? Or maybe Joyce saw great possible benefit in the move to Missouri where his brothers did not? Whatever the motivations, the move and resulting new business proved to be a tremendous success that the brothers would all come to share in and contribute to. For a SWEET LITTLE NIECE on Valentine's Day. 6 1/4" x 7 5/8"
From a room at the YMCA, Joyce mailed out batches of 100 cards to various stationers and booksellers. For his efforts, some kept the cards, making no payment; others mailed them back with strongly worded missives. Just enough, however, opted to keep the cards and mail a check. From there, Joyce built up sales until the volume of mail to that YMCA room prompted him to rent out office space. The company was up and running strong very quickly. After his brother Rollie joined him in Kansas City in 1911, they began operating as Hall Brothers. William would join Joyce and Rollie in the 1920s. Initially, they sold items printed by other printers. After losing their entire inventory in a January 1915 fire, they decided to start anew, but this time printing their own cards. By Christmas they were up and going again. These new cards would now all be marked on the back with the Hall Brothers' name. This was a time when postcards were beginning to decline in popularity and the Hall brothers thought they would find a market for cards that were mailed in an envelope - offering a bit more privacy than a postcard. This proved to be very true and quite a success for the brothers who were now printing and selling cards for Valentine's Day and Christmas. Another of their innovations was commercially made gift wrap debuting in 1917. Like Gibson, the Hall Brothers also excelled at sales innovations and merchandising. A Valentine for You Here's a little Valentine That I just went an' got -- Specially on accounts 'cause ~ I like you such a lot! By 1922 the company had grown to more than 100 people and they were producing cards for a dizzying array of holidays, events, and occasions. In 1928 they began using Hallmark in addition to the company name, Hall Brothers. Joyce (known as J.C.) was said to have liked its reference to the guarantee of quality it indicates on precious metals. 1932 brought a deal with Walt Disney that continues today. While I have seen several Disney licensed cards from the 1930s, I have not seen any from that time that also include a Hall Brothers or Hallmark logo. If anyone, dear readers, has any such cards we'd be very curious to see scans of them (please leave a comment if you are so lucky and willing to share). Similar deals with other artists were made. Norman Rockwell and Grandma Moses are among those whose work adorns Hallmark greeting cards. 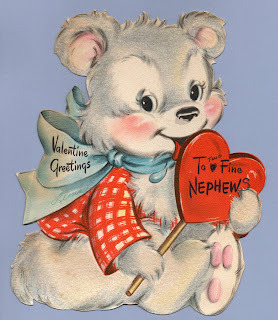 Valentine Greetings to two Fine Nephews. In 1939, Hallmark created what would come to be one of the all-time most popular greeting cards - their 'pansy' Mother's Day card. The front reads: To let you know I'm thinking of you. The message that follows inside: Pansies always stand for thoughts - at least that's what folks say. So this just comes to show my thoughts are there with you today. 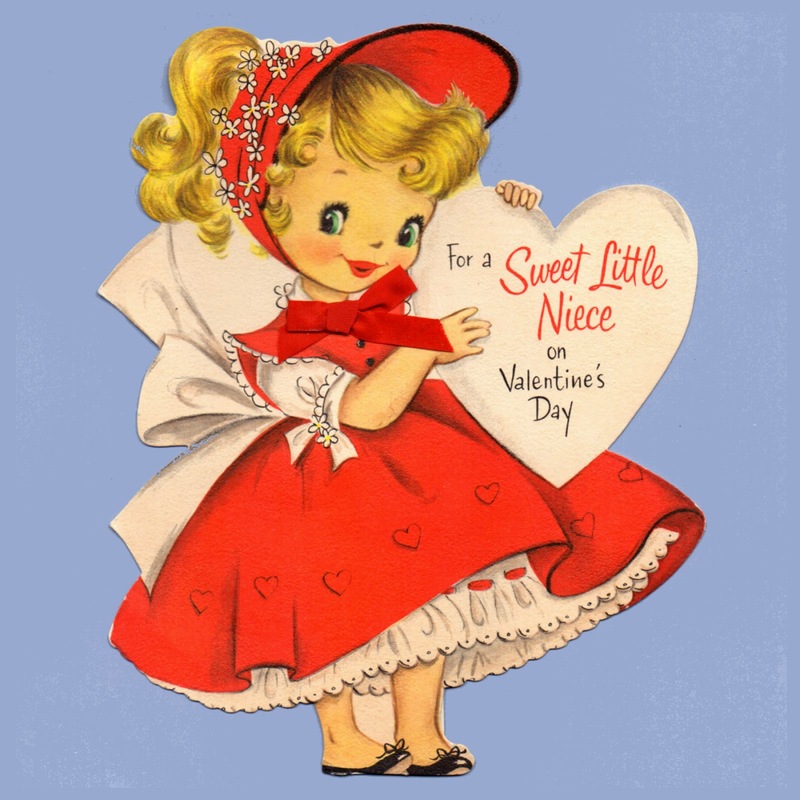 The front of the card features an image by Dorothy Maienschein which was also used in a 'love' stamp issued by the USPS in 2010. The card is die-cut and features purple pansies in a wheelbarrow-shaped planter. Hallmark quickly recognized its potential and reissued the card as a 'friendship' card in 1941. The card remains available today and has sold 30 million copies. 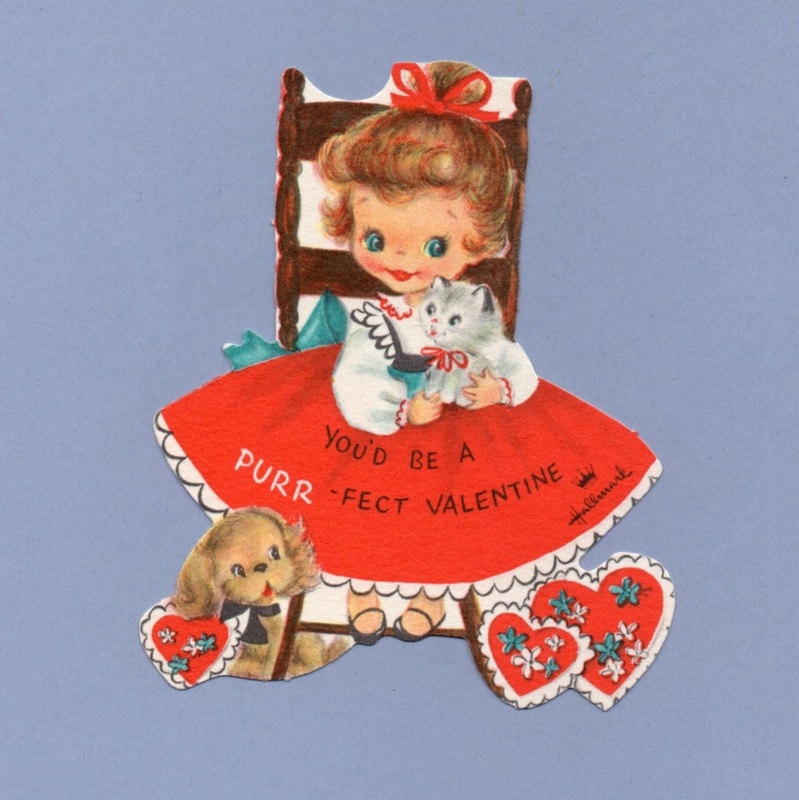 You'd be a PURR-fect Valentine! 3 1/4" x 2 5/8"
Andrew Szoeke designed the now familiar Hallmark 'crown' logo (featuring a crown above the Hallmark name) in 1949. Still, the official change in name from Hall Brothers to Hallmark was not until 1954. This means there are many cards marked with both names and some from that narrow 5-year window with both Hall Brothers and the 'crown' logo version of Hallmark. Like the crown logo, Hallmark's tag line - when you care to send the very best - has a long history with the company. It first appeared in 1944, written by Ed Goodman, and endures to this day. It is a clever line in its simplicity, that keeps it from sounding outdated despite its advanced age. Ambassador Cards was launched by Hallmark in 1959. It was a widely advertised line with great volumes of each item produced. The Shoebox line and its popular character Maxine were added in 1986. Hallmark continues on today, having branched out well beyond their initial Kansas City greeting card business to have interests in many areas. They employ thousands of people with about 4,500 of those still located in Kansas City, Mo.